Malmö Adventure Golf is a modern entertainment attraction based on the classic summer activity minigolf. 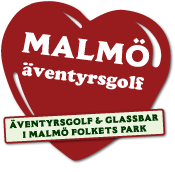 The golf course is a themed minigolf experience and a real adventure taking you to many parts of Malmö, modern and old. We call it ”Malmö in our hearts”. In close cooperation, and as a franchisee of Ben & Jerry’s Sweden, we run an ice-cream parlor serving the most delicious ice cream from Ben & Jerry’s while also serving as a cashier for the minigolf.